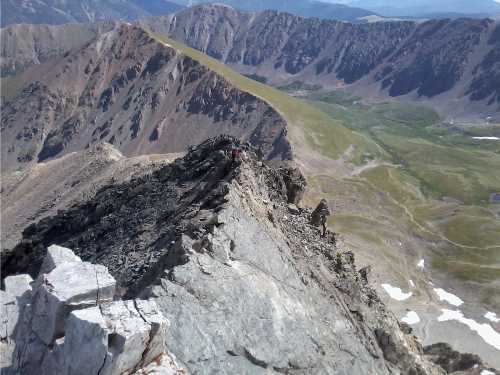 My friend Rich and I both agreed on the Torreys summit that speed climber Ueli Steck was on our minds as we recently speed-scrambled up Kelso Ridge on Torreys Peak, one of Colorado’s fourteeners at 14,267 feet. 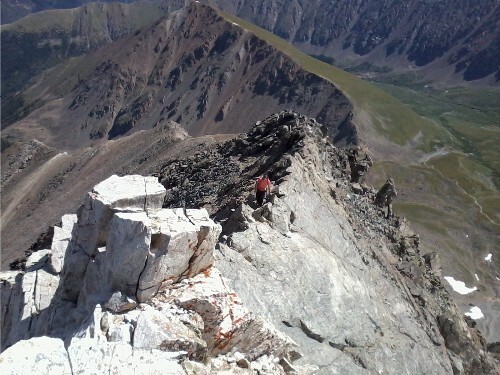 The ridge looks sort of daunting from this angle—you can see me just barely in the distance wearing an orange shirt. Rich and I met up with a group of people for an early morning hike in Denver and then decided to hike Torreys on our way back to Vail. Since we didn’t get a very early start here, we just decided that we’d motor up it from the Gray’s Peak summer trailhead at 11,280 feet. Coming along the ridge was the most exciting part. 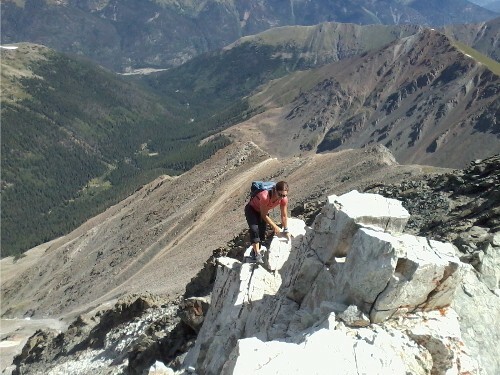 The website 14ers.com lists this as Class 3, so there weren’t any moves were you felt like you needed a rope or anything. There were a few sections of upward climbing…and you probably wouldn’t want to fall, as there were a few places that wouldn’t leave you in a pretty place. But there were lots of good places for hands and feet scooting across the ridge. An hour and forty-five minutes after we left our car, we were on the summit. We both wondered out loud how long it would have taken Ueli to make it up that. In case you don’t know who Ueli Steck is, check out this amazing five-minute YouTube video from his speed solo on the Eiger—it took him only 2 hours and 47 minutes! I think he could have made it up Kelso Ridge in about 20 minutes…or less?